Who's up for some Turkey hunting? Well, gear up next weekend for our Thanksgiving hunt! It's that time of year again. Thanksgiving! Time for roasted turkey, pumpkin pie, gathering with family and friends, and giving thanks for everything we have. I wish you all a safe and happy Thanksgiving this year! That said, are you up for a Turkey hunt in RuneScape? Well then, gear up next Saturday and get ready for our Thanksgiving event where we'll be slaughtering Turkeys in-game in the name of... well, they just taste good! Kill the most Turkeys and be featured here on our homepage. 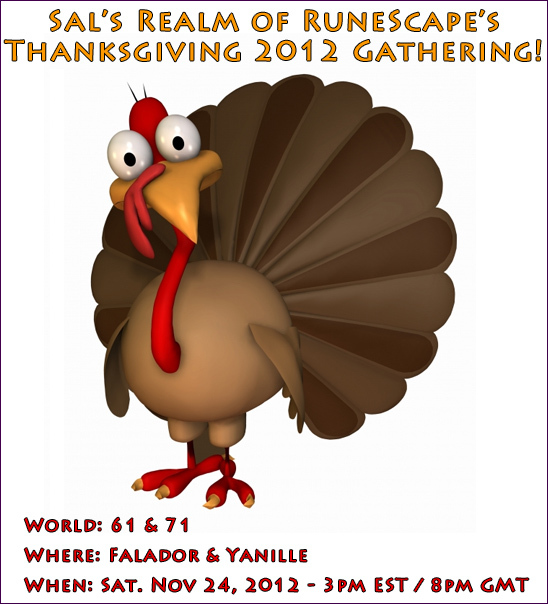 Afterwards, we'll head off to a Members' world to have a Thanksgiving feast in Viltgance's player-owned house. Be prepared for games and fun! You'll find more details in our Thanksgiving Event thread on our community forums.